At the meeting of the German Society of Chemistry (Gesellschaft Deutscher Chemiker [GdCh]) in Berlin from 10 to 14 September 2017, Ehab Al-Momani and I will present a poster about the unique role of Carbon-11 in drug research, as it is practically completely neglected on the international level. 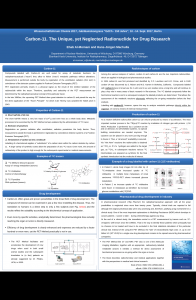 The poster will be introduced in a session by two slides emphasizing the properties of carbon-11 founding the unique features of this radionuclide in the field of drug development. You can download the poster and the slides (PDF) from the link below or by clicking on the images to the left. 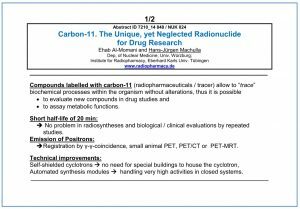 Poster Carbon 11 The unique yet neglected radionnuclide (Wissenschaftsforum Chemie 2017). 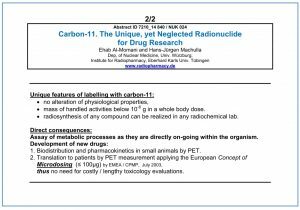 The unique role of carbon-11 in the field of pharmaceutical research and development of new drugs. Posted in Applications in medicine, Presentations and posters, Radionuclides, Radiopharmacy on 2017-08-16 by machulla.